Republicans spent most of Monday attacking Hillary Clinton while making the case that Donald Trump would make a good (read: not terrifyingly bad and unqualified) president. The capstone of the evening was the speech by Trump's wife, Melania. But, oops, unfortunately she used Michelle Obama's words to tell it. Ironically and probably to the Democrats' delight, Michelle's speechwriter once worked for Hillary Clinton, the villain of the evening. So get this: Trump isn't even qualified to take down Clinton without the help of the former Secretary of State's team. Jon Favreau, Pres. Obama's former speechwriter, pointed out the hypocrisy on Twitter. "Sarah Hurwitz, Michelle's head speechwriter, used to be Hillary's. So the Trump campaign plagiarized from a Hillary speechwriter," he wrote. That's yuge, especially when Trump constantly claims to be the best, and the only leader prepared to set the nation back on a path to greatness. Well, just to be clear, using the opponents words is not the way to do it. Leaders don't let this sort of thing happen. Plus, why would anyone believe an attack on "Crooked Hillary" when he has to use Clinton's team's words to bring the Dems down. That's simply not going to work. As Krissah Thompson reported for The Washington Post, Hurwitz can predict Michelle's thoughts on speeches before even meeting with the First Lady to go over changes — they've been working together that long. 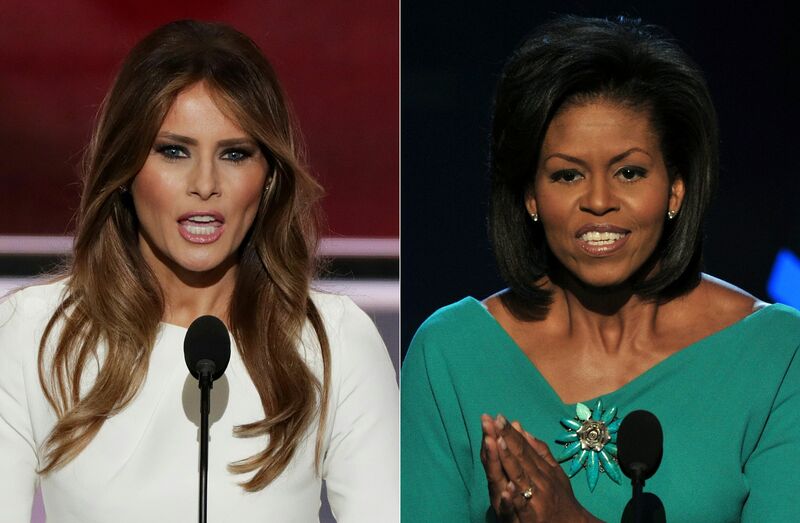 But importantly, given the controversy surrounding Melania's speech, she only began to work for the Obama campaign after Clinton conceded defeat to Obama in June 2008 as primary season was wrapping up. Thompson reports that the Obamas wanted to hire her on after hearing her "18 million cracks" in the glass ceiling speech. In writing her beautiful speech, Melania's team of writers took notes on her life’s inspirations, and in some instances included fragments that reflected her own thinking. Melania’s immigrant experience and love for America shone through in her speech, which made it such a success. This is once again an example of how when a woman threatens Hillary Clinton, she tries to demean her and take her down. That only makes sense if Clinton hired an amazing speechwriter and lost the 2008 primary on purpose so that the Obamas — obviously co-conspirators — could hire her away and have her pen a convention speech that was so amazing that a future Republican speechwriter couldn't help but repeat it. That is the Trump campaign's argument here. Clinton was threatened by Melania eight years ago and set up an elaborate scheme that ended with last night's speech. You'd think they could come up with something better than that. But then again, maybe they need someone to borrow their response from too. If they follow Joe Biden's example, Trump could just drop out. Seems like a solution, right?